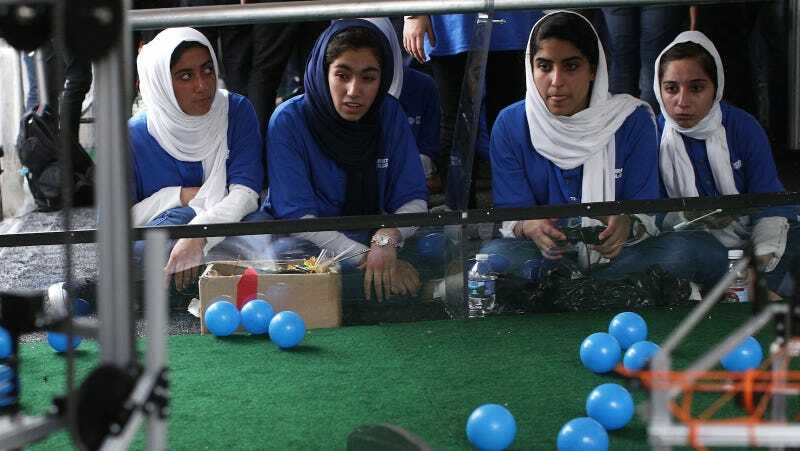 Afghanistan’s all-girls robotics team has won the Entrepreneur Award at the Robotex festival in Estonia, Europe’s biggest robotics festival, another victory for a group of young women who have come to represent the ongoing struggle for women’s rights in a post-Taliban society, as well as the arbitrary cruelty of the Trump administration. The team attracted international attention this summer when their visas to enter the U.S. were denied twice under the Trump administration’s Islamophobic travel restrictions (the administration eventually intervened to allow them entry). The United States has been at war in Afghanistan since 2001; the ongoing and deepening conflict in the region has left 9.3 million people in need of humanitarian assistance and 1.6 million refugees. The team’s teenage members are from Herat, a city in Afghanistan. The father of Fatemah Qaderyan, 14, the team’s captain, was murdered in a suicide bombing claimed by ISIS in August, just ten days after the team won a silver medal at the U.S. competition.